It's no secret that AMD is having to use old(er) graphics technology in the premium end of the midrange space until true next-generation silicon hits the retail space some time in 2019. And it's also true that the financial gap between the Polaris (premium mainstream) and Vega (high-end) architectures remains vast. The current premium mainstream crop of Radeon cards can trace its provenance back to the Polaris architecture released in June 2016. Productised as the Radeon RX 480 and, later, as the RX 470, performance was solid at 1080p and generally a good match for the rival GeForce GTX 1060 that was also launched that summer. 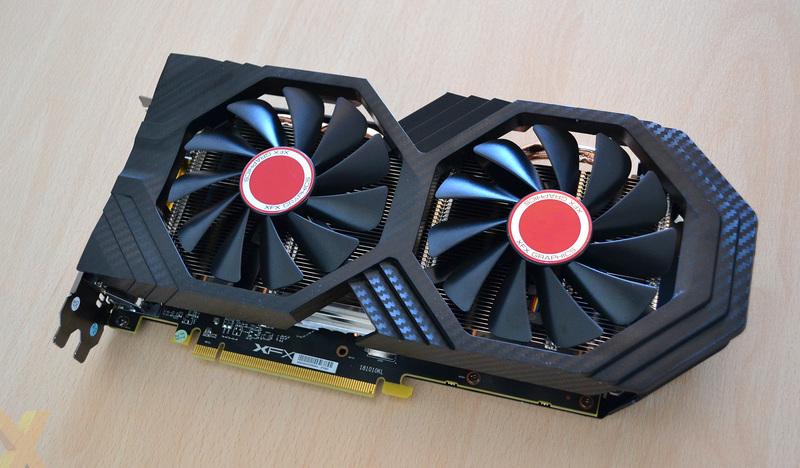 Last year saw the RX 480/470 duo effectively rebranded as RX 580/570, albeit with a minor clock and power bump. A lack of innovation didn't matter so much because the cryptomining crowd lapped up all cards and caused prices to skyrocket. That mining craze is all but over. Underscoring that, again, nothing new is coming on the silicon front for a while, AMD has readied a 'quick and dirty' upgrade to the RX 580. Enter the Radeon RX 590 8GB GPU. Let's check out the specification. The new Radeon RX 590 is based entirely on the same Polaris GCN 4th Gen architecture as the extant RX 480 and RX 580(X). It also uses the same number of shader-cores, ROPs, memory type and bus-width footprint, so we need to examine what is different. It turns out there's not a lot. The big change from a manufacturing point of view is that RX 590 is the first GPU in its class to use 12nm FinFET technology. The smaller geometry enables the Polaris core to scale its frequency higher, from a peak of 1,340MHz on RX 580X - the April 2018 update to RX 580 - to 1,545MHz here. In fact, it is reasonable to consider this GPU as a heavily-overclocked RX 480 at its heart. Even with 12nm at the helm, AMD and its partners are still having to dial up the voltage in order to achieve these speeds. We know this because the default power consumption rises to a considerable 225W. That is exactly 50 per cent more board juice than the two-year-old RX 480! And that's your lot. There's no extra magic under the hood; such a core-frequency hike would have worked better if in concert with appropriate increases in the memory speed, a la Nvidia. RX 590 should really have been outfitted with 9Gbps GDDR5 for further performance segmentation. We shouldn't be too disparaging about the lack of performance and architecture progression in this part of the market because Nvidia has yet to truly overhaul its long-in-the-tooth GeForce GTX 1060 (in its many variants). The use of 12nm and extra power on tap ought to result in partners pushing the core boat out even further. And that brings us on nicely to the XFX Radeon RX 590 Fatboy card. Great name, huh? 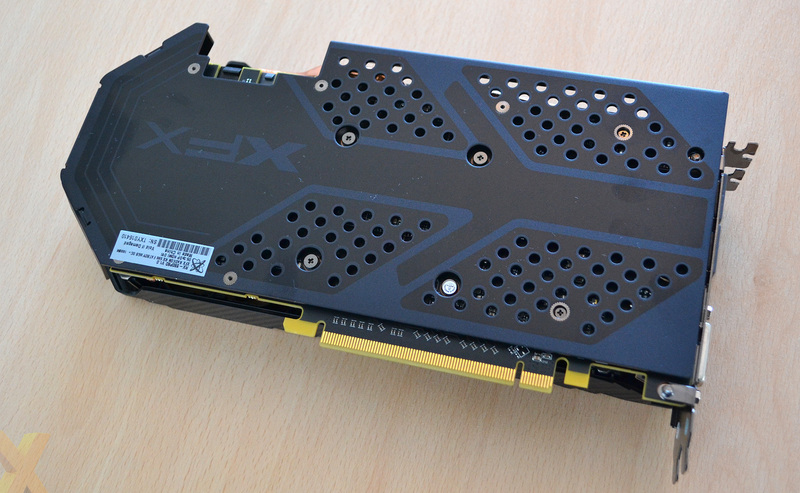 XFX wants minimal hassle in the transition between premium Polaris cards so therefore carries over the same cooler present on the RX 580 GTS in its many iterations. The cooler is relatively basic and lacks any form of lighting. Twin 100mm, 11-blade fans - which stop at low loads - sit on top of a single heatsink containing four heatpipes - two thick, two thin - that meet at a central copper GPU block. VRMs are located on the left-hand side of the RX 590 PCB, and XFX sensibly adds a small coldplate and thermal material for additional cooling. There's also thermal pads between the central block and memory chips, and the expectation is that fan airflow will help cool all the hot parts of the card. The design also features ultra-low-noise inductors, and we can report there was no irritating buzzing sound when under sustained load. The PCB also shows that XFX upgrades the solitary 8-pin PCIe connector for the RX 580 by adding a further 6-pin, necessary for ensuring there's enough extra power on tap. We also see a wraparound backplate that's larger than the PCB. With that extra space, the card measures 270mm long, 125mm high and 50mm thick, which makes it take up just over two slots. Weighing 850g, there's no chance of sagging in your PC. Next to the 6-pin connector is a dual-BIOS switch that, in the other position, loads a hash-rate-optimised BIOS. Fatboy increases the default (peak) 1,545MHz RX 590 clock to 1,580MHz, and we can further report that, unlike most RX-based cards, this XFX model keeps to that prescribed speeds at all times. It is likely the 225W+ power limit, up from 185W, enables frequency stabilisation. That full-width backplate, as expected, becomes pretty warm to the touch. It's arguably necessary for the wattage-thirsty RX 590 GPU. Outputs remain standard for the RX line, comprising a trio of DisplayPort, HDMI and DVI. Pricing is where it may become nebulous upon launch. AMD reckons the RX 590 will be $279 (£250, hopefully), even for factory-overclocked models such as the Fatboy. That's pretty good pricing, all things considered. Sweetening the deal for the gamer, however, AMD is offering three free games - Devil May Cry 5, The Division 2, and Resident Evil 2 - when you buy an eligible RX 590 card or computer. Full T+Cs will be available from this link.